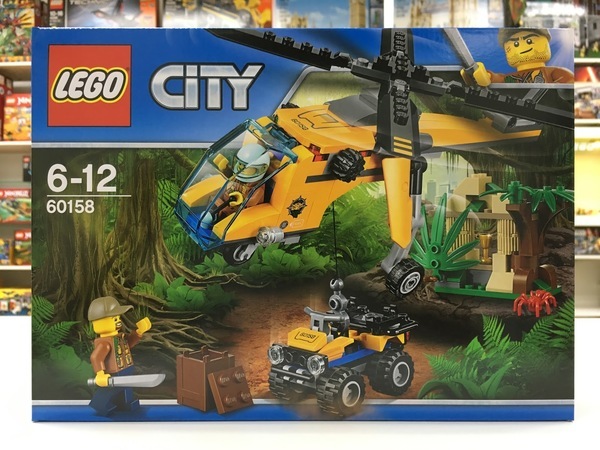 Head deep into the LEGO® City jungle with the Jungle Explorer Helicopter, featuring an opening minifigure cockpit, spinning rotors and working winch, an ATV with space for a minifigure, a treasure box and a temple with moving leaf revealing a gold-colored chalice. Includes 2 minifigures, plus a spider figure. Includes 2 minifigures: a pilot and an explorer, plus a spider figure. 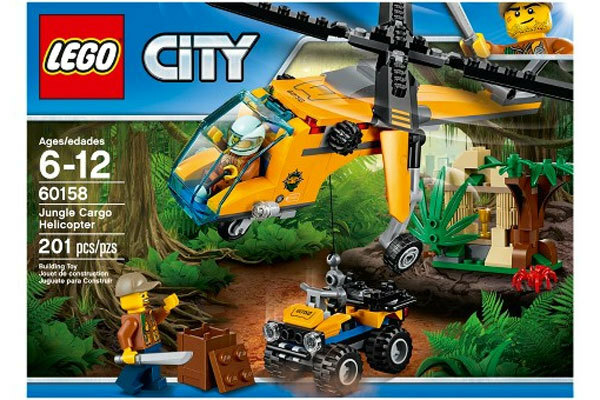 Features a helicopter with opening minifigure cockpit, spinning rotors and a working winch, plus an ATV with space for a minifigure. Also includes a temple with moving leaf revealing a gold-colored chalice element. Hook the helicopter winch to the ATV and fly it into the jungle. Turn the knob to lower the ATV to the ground. Push the leaf aside to reveal the golden cup. Load the cup in the box to haul it back to camp with the helicopter. Accessory elements include a box and a machete. Helicopter including rotors measures over 3” (9cm) high, 9” (24cm) long and 7” (18cm) wide. ATV measures over 1” (4cm) high, 2” (6cm) long and 1” (4cm) wide. Temple measures over 1” (5cm) high, 1” (3cm) wide and 3” (9cm) deep.